Protein blend (Calcium caseinate, Milk protein concentrate, Sodium caseinate), Cocoa powder (processed with alkali), Fructose, Skim milk powder, Natural and artificial flavors, Sunflower oil, Maltodextrin, Sea salt, Modified corn starch, Vitamin and mineral mix (Ascorbic acid, Ferrous fumarate, Vitamin E as acetate, Niacinamide, Copper gluconate, Zinc oxide, Calcium d-pantothenate, Manganese sulfate, Pyridoxine HCI, Riboflavin, Thiamin mononitrate, Vitamin A as palmitate, Chromium chloride, Folic acid, D-biotin, Potassium iodide, Sodium molybdate, Sodium selenite, Phytonadione as vitamin K1, Cholecalciferol as vitamin D3, Cyanocobalamin as vitamin B12), Guar gum, Dipotassium phosphate, Magnesium oxide, Sunflower lecithin, Sucralose & acesulfame-potassium (non-nutritive sweeteners), soy lecithin. Silicon dioxide, Mono-diglycerides, Tocopherols. Manufactured in a facility that processes egg, wheat, peanuts, and tree nuts. Our shakes are loaded with 15g of protein, 4g of fiber, along with vitamins, and minerals— all in just 100 calories of luscious chocolate. Our shakes are manufactured in a facility that processes egg, wheat, peanuts, and tree nuts. We’ve heard from many people just like you who said that having a sweet ‘treat’ or some chocolate for snacks will help them stay on track during their program. When we added these shakes, we made sure the formula was high in protein, vitamins, minerals, and fiber. At just 100 calories per serving, they make a perfectly balanced snack for in-between your PTF meals so you won’t gain weight. Meats, eggs, and veggies are still #1 for weight loss, but we feel that helping you stick to the plan by offering a healthy alternative to sweets is an important factor to your success as well. 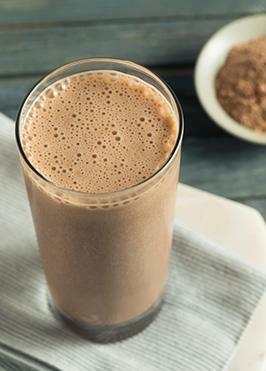 For best results, mix vigorously in a shake cup with a shaker ball or with a small hand-held blender. You can also blend your shake with ice in a blender to create more of a milk shake. Use more or less water depending on the consistency you desire.